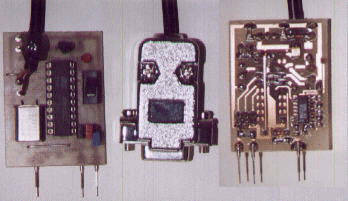 The ScanConverter is simply a "plug" that plugs into the ALDL port of the Fiero and converts the coded datastream in realtime to an RS232 ASCII datastream that any computer with a serial port can read. This includes Palm Pilots, Windows CE computers, Newtons, etc. It is the size of a matchbox and uses an 8051 based microcontroller with on-board Flash-EEPROM as the workhorse. The ScanConverter works with all V6 Fieros and the 84-86 L4's, but not the 87/88 DIS 4 cylinder cars. There is virtually no limit to the number of ways you can display the information you can read with the ScanConverter. The image to the left was generated from an approx. 90 second run, visualized using MS Excel and only three items. There are over 20 more to choose from, in any combination. Combine this with the power of Excel and you begin to get an idea of what you can do with this tool. Click here to download the Excel file to play with the data yourself! I had the idea to build an intelligent plug a few years ago on a flight to London. I scribbled the schematics on a napkin (really!) and got to work when I got home. The original concept was to keep the parts count at a minimum and hence keep the circuitry cheap. Someone on the Fiero mailing list pointed out that my cheapo transistor/pullup inverter might be incompatible with some desktop computers. True. So I decided to use a Maxim chip for true RS232 levels. A little more expensive, but a lot more compatible. The switch is used to change between Trouble Code mode (in which only trouble code numbers are output) and "normal" mode. The LED is on whenever the ScanConverter has received a complete frame and is transmitting it to the PC. The circuit board design can be found here. Of course, you can also use real-time display programs, or write your own. Here are several programs for different platforms that demonstrate what the ScanConverter can be used for. Note: These programs don't do anything useful without the ScanConverter. DOS/Qbasic/V6 If you would like to see what the QBasic program that formats the ScanConverter's output looks like. Works in a DOS box under Windows too! DOS/Qbasic/L4 This is the 4 cylinder version of the Qbasic program. 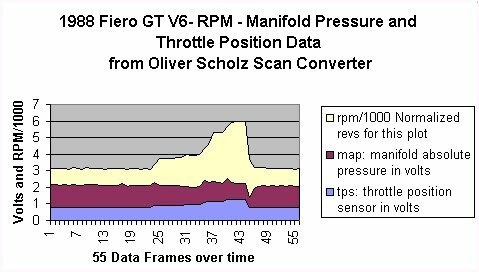 Windows/Freeware/V6 Freeware program written by Peter Wieners. Partially German, but looks still very nice! Download the latest version directly from his website by clicking here. Please direct comments or suggestions directly to the author. Another note: I can not help you debug the circuitry if you decide to build a ScanConverter yourself. Sending a board back and forth across the pond is not exactly cost effective, and I'd be stuck with the postage bills.